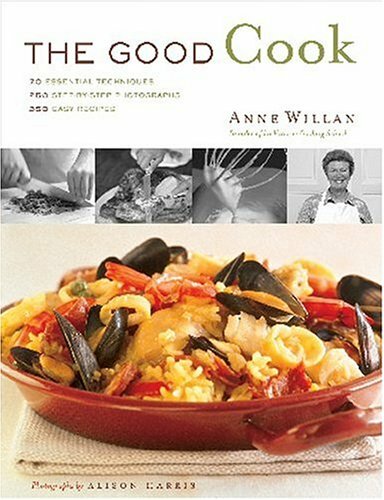 Internationally renowned as the founder of Ecole de Cuisine La Varenne, Anne Willan has published many best-selling cookbooks. Her La Varenne Pratique has become an indispensable text for professional chefs, while the Look and Cook series and subsequent public television program brought European cuisine to a mainstream American audience. Here, the award-winning author offers her expertise to a new market, outlining 70-plus techniques and hundreds of accompanying recipes for the kitchen novice. The quick and easy dishes will appeal to both beginner and seasoned cooks. Categorized by main ingredient, the ten chapters address every subject of import to home cooks, including essential flavors and sauces; fish, meat, and poultry; vegetables and eggs; pasta and pastry. Step-by-step photographs illustrate the techniques, which are followed by recipes that utilize them. Readers will learn, for example, the best way to chop and chiffonade herbs, dice an onion, and peel a tomato, then apply these skills to the preparation of Tomato, Mozzarella, and Basil Salad; Real French Onion Soup; and other dishes. How to open oysters, roll and tie a roast, combine milk, butter, and eggs to create a classic white sauce: All the techniques a home cook could ever need are covered. Perfect for everyday use, this richly illustrated volume will be to amateurs what La Varenne Pratique is to pros-the last word, a book they'll turn to again and again.